3. All cleaning solutions are not created equally. Adding the right cleaning solution to your water will give you better results than water alone. Just be sure to use the correct solution; the wrong one may destroy what you were cleaning. Different materials need different cleaner: the soap you would use for your deck and fence has different chemicals than the one you would use for your home’s siding. Premixed soaps will list the areas it can be used on. Use the right cleaner for what you want to clean. 4. You could seriously injure yourself or others. never spray a person or animal - it could injure or kill them. use safety glasses, goggles, or a full face shield. wear closed toe boots or shoes. stay at least 5-6 feet back from the area you’re cleaning. start at the lowest setting and test it on a hard surface before moving to windows or soft surfaces. use the right nozzle for the task. 5. 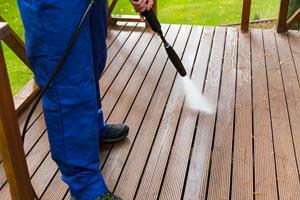 Cold weather may damage your property if you’ve recently power or pressure washed. You don’t see many people out pressure or power washing in winter. There’s a good reason for that. It can take several days for an object to dry completely after cleaning, and if the water in or on what you’re cleaning freezes, it can expand and damage your property. Make sure there aren’t any expected freezes for about a week after you power or pressure wash.
With warmer weather on the horizon, now is a great time to spruce up your old home or to find a new house to make your own. Give me a call if you or someone you know has any questions about real estate! Maggie Larson Mammoth your residential specialist and owner, broker of Sierra Resort Real Estate and Sierra Resort Property Management respresenting more than 100 luxury long-term rentals.